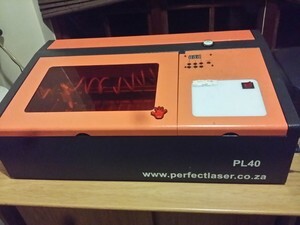 The perfect entry laser cutter and engraver for hobbyists and crafters. You will be able to cut and engrave many kinds of non-metal materials, such as MDF; acrylic, bamboo, cloth, plastic, rubber, plexiglass, and more. Markets to explore: Scrapbooking , Wedding Decor and accessories, Rubber stamping, Clocks, Model Building, Jewellery and much, much more. • This machine is designed to operate a MAXIMUM of 150 hours per month. • You may require a technician to install as settings may be affected when transported; Original supplier, highly recommended and with excellent technical support, has offices in Durban, Cape Town and Johannesburg.